Preheat the oven to 175°C. Line a baking sheet with baking paper, add the pumpkin and beetroot, drizzle with coconut oil, season with salt and pepper and toss to coat evenly. Roast for 20 minutes, remove from the oven and set aside. While the veggies are roasting, heat a teaspoon of coconut oil in a skillet, add crushed garlic cloves and fry for a minute. Add the fresh spinach and cook until all its liquid evaporates. Set aside to cool. In a small bowl add the dressing ingredients and whisk to obtain a creamy liquid. 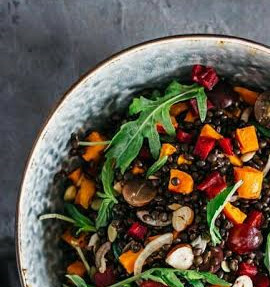 In a large bowl add the lentils, roasted vegetables, grapes, onion and spinach; toss to combine. Add the dressing and rocket and toss once more. Top with toasted hazelnuts and serve.